Needless to say, I was not pleased with this comment and wrote a 3,000 word response that concluded with some advice for Mr. Parker, open letter-style. But I never published that post because I thought it would not really do anything positive except, perhaps, make me feel a bit better. Fellow bloggers Joel Vincent and Joe Roberts covered this ground a bit more diplomatically than I did, but with much the same tone. So I was somewhat surprised to see this issue rehashed this week in the Wall Street Journal. Another discussion broke out on the subject on eBob which was somewhat capped off by a mea culpa of sorts by Mr. Parker. In my book, case closed, but I’m sure there will be some additional chatter in the blogosphere because it creates more traffic and comments. But I think all this raises a more fundimental question; what is the future of wine writing? Jeff Lefevere over at Good Grape made a good point about bell curves the other day and it’s clear that dominance of The Wine Advocate and other wine review newsletters is on the downward slope of the curve. Local newspapers are cutting back on wine writers even in big metros such as Los Angeles and New York. As I’ve written here before, I don’t think there is a great future for wine glossies such as the Wine Spectator and Wine Enthusiast unless they transform their business models quickly and figure out how to make money online. And who knows if wine writing will exist in any form. If what only exists is the blog world, God help us. I’m not saying that some of my colleagues don’t give great blog, but finding the knowledgeble folk who don’t have something to ‘sell’ is tough. And then finding some voices who have done homework is even tougher. Whatever the format, there will be a void in wine writing in the next decade that will be filled by new voices. With the rise of Millennials as major wine consumers, this format will no doubt be digital and presented online in several contexts (text, video, audio, mobile). The question at hand is if the serious wine consumer of the future will pay for this information or will expect this to be freely available and ad supported. My gut tells me it will be a bit of both but I seriously doubt there will be a solo critic success story like Robert Parker. It’s not because the talent doesn’t exist but that the circumstances are vastly different than they were 30 years ago when Mr. Parker got his start. Back then you didn’t have to be independently wealthy in order to sample the top wines of the world. You could buy them and share them with friends at weekend tastings where everyone chipped in for the wines. This is how the wines for The Wine Advocate were financed along with Mr. Parker’s rather generous personal wine budget (how he talked his wife into this early on would make a great story, but I digress). Today it is nearly impossible for the independent wine blogger to buy the sufficient amount of wine to provide the breadth of coverage required to attract enough readers to make a wine blog financially viable. Yes, we do receive samples but this alone doesn’t provide enough tasting opportunities; the reviewer still needs to travel and purchase more wines at retail. Both not easy given the current economic climate but even in better times one would have to spend at least $100,000 a year in order to review enough wines to make a serious go of it. But I do think that several wine bloggers working together at a single blog is the future of wine writing. Each could cover a wine region or variety in depth and in aggregate this content would attract enough of an audience to sell sponsorships, drive affiliate programs and other monetization opportunities. Think Engadget but for wine. 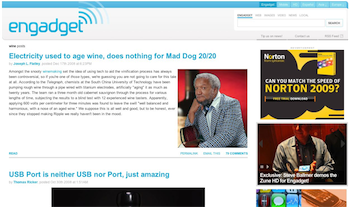 I think we will see such a blog launch yet in 2009 and there will be several existing wine bloggers who will be convinced to write for this site as they continue to maintain their own blogs. The “Robert Parker of the future” will be a blogger but I doubt he or she will go it alone. But together, even a small team could create enough content and traffic to build the next wine publishing empire. The time is now; the question is who will step up and try to do this first?